The Vintage Watch Company was established in 1995 dedicated to showcasing Vintage Rolex wristwatches from c1910- c1970. Our collection of over 1000 pieces is simply unparalleled and we are proud to have become a destination store for the world. The Vintage Watch Company has also built an unrivalled collection of Vintage Rolex Sports watches from c1950 onwards. We offer you the unique opportunity to view under one roof some of the Rarest Vintage Rolex Sports models in the world. Choose from The First Rolex Submariner, later coined the James Bond, or the Early GMT Master made for Pan Am transatlantic Pilots. Decide between the First Rolex Explorer's made famous by the Everest Expedition or the later Explorer II worn by Steve McQueen. We also specialise in Early Chronograph and Pre Daytona Rolex watches as well as all later Daytona models. To support our collection we have created a dedicated state of the art workshop. Each watch is painstakingly brought back to its original condition and is sold with a 2 year International Guarantee. 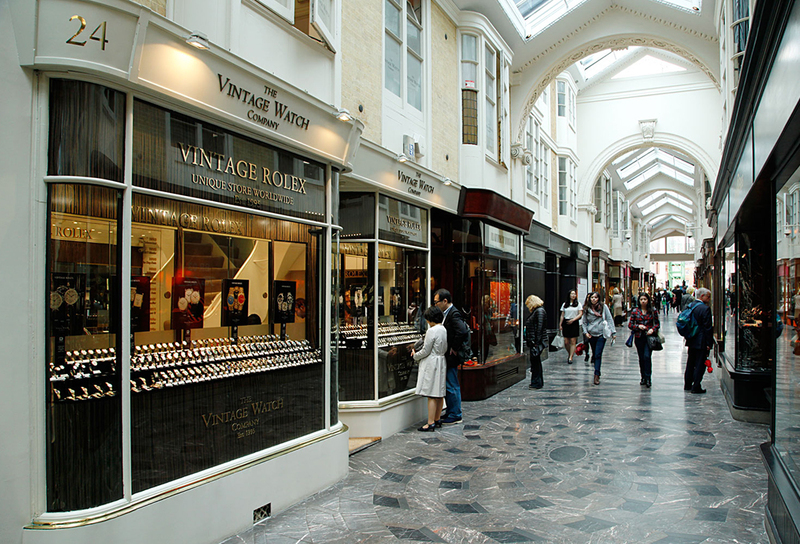 Culminating in a unique store worldwide situated in London's Burlington Arcade where we look forward to welcoming you.